The women’s basketball season started this week, and there were some excellent opening games. 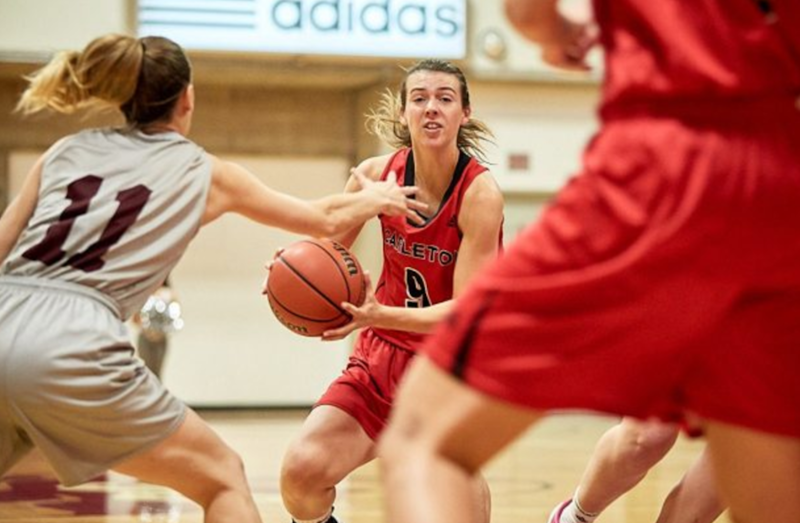 One of the highlights came in Ottawa Friday., where the Carleton Ravens (fresh off their first-ever women’s basketball national title last year) narrowly beat the cross-town Ottawa Gee-Gees 58-56 on the road. Carleton got off to a great start in that game, leading 17-13 after the first quarter and extending that lead to 22-13 thanks to five straight second-quarter points from Nicole Gilmore. However, Ottawa bounced back to lead 33-32 at the half. The Gee-Gees then put up a 10-point lead of their own, but the Ravens cut that lead to two by the end of the quarter and then took the lead themselves in the fourth, eventually holding off an Ottawa rally to win. Madison Reid led the way for Carleton Friday with 19 points, including five three-pointers, and also added three assists and a steal. Nichole Gilmore chipped in 13 points and a game-high nine rebounds for the Ravens, while Emma Kiesekamp added six points, eight rebounds and three blocks. For the Gee-Gees, Amélie Hachey posted 15 points and seven rebounds and Brooklynn McAlear-Fanus had eight points, four assists, four steels and three rebounds, while Brigitte Lefebvre-Okankwu chipped in 13 points and eight rebounds off the bench. Elsewhere in women’s basketball, the Saskatchewan Huskies (last year’s national runners-up) fell 71-64 to the UBC Thunderbirds on the road Friday, but bounced back to win a rematch 70-60 Saturday. On Friday, Keylyn Filewich led the way for UBC with 20 points and 9 rebounds, while Jessica Hanson added 19 points, five rebounds and five assists. Sabine Dukate led Saskatchewan with 20 points in that game, while Megan Ahlstrom had 13 points and six rebounds. On Saturday, Libby Epoch recorded 14 points for the Huskies and Katriana Philipenko had 13 off the bench. Maddison Penn had 15 points, three rebounds and two steals for the Thunderbirds and Filewich chipped in 14 points. Meanwhile, the Regina Cougars (last year’s third-place team) started their season with a pair of road wins over the Calgary Dinos. In Friday’s 81-76 win (which featured 17 lead changes), Kyanna Giles had 29 points for the Cougars, who pulled out a five-point win despite trailing with 45 seconds left. In Saturday’s 85-75 victory, Regina second-year guard Faith Reid was held scoreless in the first half, but erupted for 23 points down the stretch (including five three-pointers and 17 total points in the fourth quarter) to both improve her previous game-high of 12 and help her team to a win. The 54th Vanier Cup Presented by Promutuel Insurance is fast approaching, and the postseason games leading up to that got underway this weekend with the OUA quarterfinals (the other three conferences wrapped up their regular seasons). Those games both saw victories for the home teams, with the No. 7 Guelph Gryphons (the conference’s third seed) beating the sixth-seeded Waterloo Warriors 45-34 and the No. 8 Carleton Ravens (the OUA’s fourth seed) edging the fifth-seeded McMaster Marauders 30-25. The game in Guelph was a rematch from last week’s regular-season finale, which the Gryphons won 47-44 in double overtime. This time around, the final score wasn’t quite as close, but the game was still a tough battle. Guelph jumped out to an early 10-0 lead before Waterloo got on the board and expanded their lead to 17-7 at the end of the first quarter and 31-21 at the half, but the Warriors never went away, and reduced the deficit to nine points with 4:37 left in the game. That was as close as they got, though, and their first postseason trip since 2003 came to an end. Rookie running back Jean-Paul Cimankinda shone for the Gryphons, collecting 258 yards and three touchdowns on 29 carries. Meanwhile, quarterback Theo Landers completed 16 of 23 passes for 240 yards and two touchdowns and also picked up another rushing touchdown on a 26-yard scramble. And receiver Kade Belyk caught five passes for 93 yards and a touchdown. In Ottawa, the Ravens got off to a slow start and trailed the Marauders 5-1 early, but then jumped in front 8-5 after running back Nathan Carter ended a drive with a one-yard touchdown run. Thanks to some strong defensive play (including two sacks from Kenny Onyeka), another one-yard touchdown run from Carter and two field goals from Mike Domagala, Carleton led 21-5 at the half and then extended that lead to 30-5 following a safety and a 26-yard touchdown run from Carter. However, McMaster then stormed back to make it close and got within five points with 2:41 left, and they got the ball back with two minutes to go. An end-zone pass attempt fell incomplete, though, and some further running from Carter (who finished the day with 172 rushing yards and three rushing touchdowns) sealed the deal for the Ravens. Next week, Carleton will travel to face No. 1 Western (the top OUA seed) in one conference semifinal, while Guelph will go on the road to take on No. 5 Ottawa (the second seed). The No. 1 Laval Rouge et Or will host the Sherbrooke Vert & Or and the No. 4 Montreal Carabins will host the McGill Redmen in the RSEQ semifinals, while the AUS semifinal will see the StFX X-Men hosting the Acadia Axemen (with the winner advancing to the Loney Bowl against the Saint Mary’s Huskies). In Canada West, the No. 3 Calgary Dinos will host the Manitoba Bisons and the No. 10 UBC Thunderbirds will host the Saskatchewan Huskies. The York Lions picked up their second consecutive OUA field hockey title this weekend, taking down the Guelph Gryphons 1-0 in Sunday’s final thanks to a sixth-minute goal from Jaslan Stirling. Alycia Gray picked up the shutout for York, standing strong in net throughout and particularly thwarting a Guelph flurry in the final five minutes. That marked the second straight year where the Lions had beat the Gryphons in the conference championship. York got to the final thanks to a 16-0 quarterfinal win over the McMaster Marauders Friday and an 8-2 semifinal victory over the host Waterloo Warriors Saturday. Rookie Amber Sandhu had five goals for the Lions Friday (one higher than her season-long total), while Stirling added a hat trick and Frankie St. Louis and Haley Bannister each had two goals. On Saturday, Chloe Walton notched a hat trick for York, while Claire Church and Sandhu each chipped in two goals and St. Louis added a single. Stirling left that game after taking a ball to the face, but was able to return and help the Lions to victory Sunday. They’ll now host the Victoria Vikes in the best-of-three national championship this coming weekend. The Calgary Dinos are coming off their first-ever national title in men’s basketball, and they got their title defence off on the right foot with a pair of home wins over the Regina Cougars this weekend. On Friday night, after raising their championship banner, the Dinos bounced back from a 19-17 deficit after the first quarter to lead 41-28 at the half and eventually win 91-68. On Saturday, they led almost throughout a 95-60 win, posting leads of 21-10 after the first quarter and 52-21 at the half. Mambi Diawara posted 30 points, 13 rebounds and four assists for Calgary Friday, making five three-pointers along the way. He got some help from Brett Layton, who had 15 points and 10 rebounds (including seven offensive boards), and from Andrew Milner, who chipped in 13 points off the bench. On Saturday, Lars Schlueter recorded a game-high 22 points for Calgary, while Layton added 13 points and 13 rebounds. A better effort leads to a 35-point win and a sweep of the Regina Cougars. The OUA men’s basketball season also got underway this week, and the national runner-up Ryerson Rams got off to a good start as well, thumping the University of Toronto Varsity Blues 103-51. Filip Vujadinovic led Ryerson with 25 points, while Tanor Ngom threw down some impressive dunks. 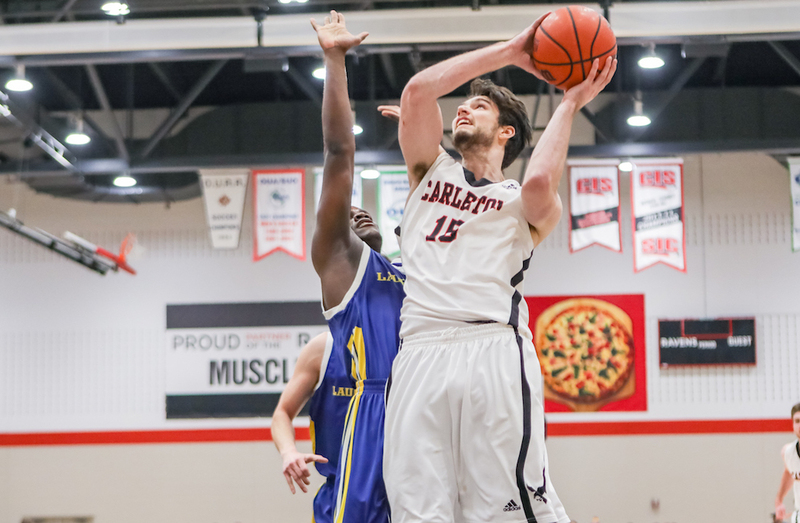 Elsewhere, the defending OUA champion Carleton Ravens beat the Ottawa Gee-Gees 87-69 on the road behind 31 points from T.J. Lall. The RSEQ and AUS women’s rugby conference title games took place this weekend, and the No. 1 Ottawa Gee-Gees and No. 4 StFX X-Women came out on top. In Quebec, Ottawa beat the No. 3 Laval Rouge et Or 40-19 Friday to claim their fifth-straight conference championship, while in Atlantic Canada, the No. 4 X-Women downed the No. 7 Acadia Axewomen 38-7 for their 20th overall title. The RSEQ championship saw Ottawa build an early 14-7 lead and then expand on it, leading 26-12 at halftime and going on from there. Fourth-year second-row Tori Wyman recorded two tries for the Gee-Gees, including the important early one that put them up 14-7, while Ottawa rookies accounted for 11 points overall. This marked the fifth straight conference title for head coach Jen Boyd, scrum-half Erin McCallan and back row players Emily Babcock, and Paulina Karwowski. In the AUS championship, StFX only led 12-7 at the break after a hard-fought first half, which saw them jump out to a 12-0 lead but Acadia respond with a try from Nicole Pahl and a conversion from Alysha Corrigan. However, the X-Women then scored 26 straight points in the second half to take the win. Third-year centre Meghan Buchanan led the way for StFX, recording their first try and making important plays throughout, and she was named the AUS championship MVP. The Gee-Gees, Rouge et Or, X-Women and Axewomen are all headed to the national championship, which Acadia will host (for the first time ever) this coming weekend. The cross country championships took place in all U SPORTS conferences this weekend, but perhaps the biggest news came in Ontario. The results there saw the No. 2 McMaster Marauders claim the men’s title, their first team title in the sport since 1964. Meanwhile, the No. 1 Queen’s Gaels claimed their second consecutive title on the women’s side, while the No. 8 Gaels’ men’s team finished second to McMaster. And that means that the Guelph Gryphons (ranked first nationally on the men’s side and second on the women’s side) will be heading to nationals (hosted by Queen’s in two weeks) without a men’s or women’s conference banner for the first time since 1998. On the men’s side, second-year runner Max Turek led the way for McMaster, claiming the individual title with a time of 31:57 and becoming just the third Marauder men’s runner ever to win an individual conference title (following Dave Lorne in 1992 and Dave Knox in 1964). He was followed by Sergio Raez Villanueva (seventh overall), Alex Drover (eighth), Josh McGillivray (11th) and Jon Favero (18th), giving McMaster a team score of 45 (14 clear of the second-place Gaels). Massive result in London, as Max Turek wins the individual title at the @ouasport Championships, and leads the Marauders to team gold! On the women’s side, it was again the sister duo of Brogan and Branna MacDougall leading the way for Queen’s, placing first and second. Rookie Brogan has won all three races she competed in this season, while Branna won the OUA championship last year and placed third at nationals. What #BannerSeason is all about! Another rookie, Makenna Fitzgerald, finished fourth overall for the Gaels, while Kara Blair was seventh and Laura Yantha placed 20th, producing a team score of 34 for Queen’s, six ahead of the second-place University of Toronto Varsity Blues. Several wrestlers with U SPORTS ties represented Canada in the senior wrestling world championships in Budapest, Hungary over the past two weeks, and one of the coolest moments came from Diana Wiecker. Wiecker, a 29-year-old wrestler who’s also a registered nurse and a mother of two young children, previously won three university titles with the Brock Badgers before winning the Canadian national championships in the 55 kg class last fall. That sent her to nationals for the first time. This year, she made it back to nationals and picked up a bronze medal Thursday, defeating Zhuldyz Eshimova of Kazakhstan 3-2. Still haven’t slept but some Hungarian lady in a Quebec nordiques touque tried to sell me a newspaper so I feel like I’m dreaming. 🐝🏒 WH - A strong push in the third period isn't enough as the Stingers fall to McGill. W🏐 | The celebration begins.